Concentrated alkaline-based cleaner for deep-down cleaning of stubborn dirt from all surfaces. 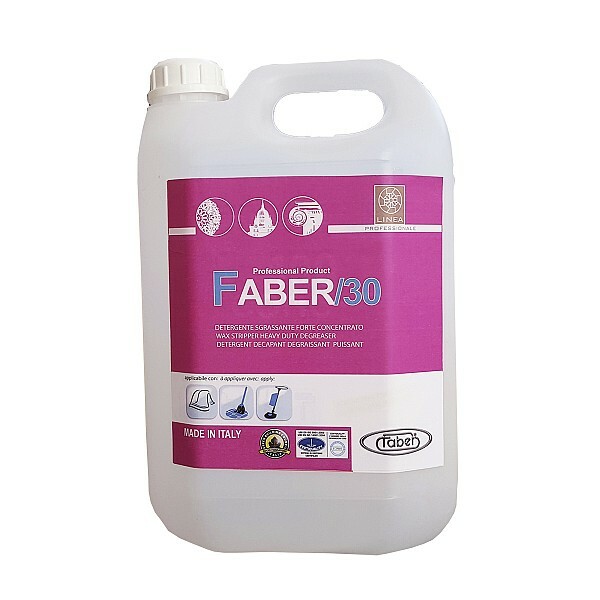 FABER 30 is a concentrated alkaline-based cleaner that is extremely effective when it comes to deep-down cleaning of all surfaces with general dirt – including long standing – caused through a normal build up on floors from foot or vehicle traffic. FABER 30 is a versatile cleaner that is quick and easy to use, while being strong on dirt but at the same time, extremely gentle on surfaces, even the most delicate types. This is why it can be used on floors of all types, including polished marble and glazed, polished ceramics. The special formula and careful balance of active ingredients make this the ideal solution for deep-down cleaning and it also provides excellent results on synthetic floor coverings, such as PVC, epoxy or polyurethane resins, and flooring over large areas used as car parks or vehicle areas, inside and out, since it is particularly active against rubber tracks from tyres, caused by the transit of cars, forklifts and trucks. FABER 30 can be used according to traditional methods for washing floors, such as cloth or brush, or with mechanical equipment such as single-disc machine or hard floor cleaner.